I started with the Sweet-and-Smoky Barbecue Sauce1 and then added my own extras to the sauce, like apple juice. 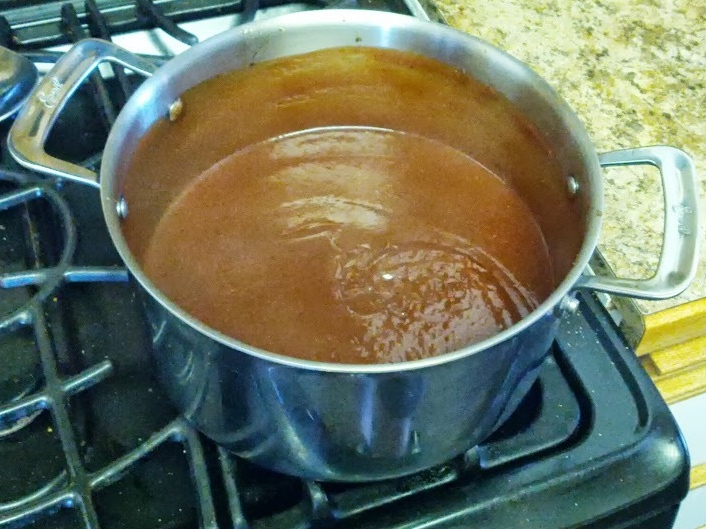 I call it the Apple Pie BBQ Sauce, because it reminds me of the spices and flavors in an apple pie. The sauce combines well with my Apple pie rub. Combine all ingredients except the ketchup in a non reactive pan. Bring to a simmer on medium heat. Cook uncovered for about 5 minutes until everything dissolves. Stir constantly. Reduce heat to low and cook uncovered for about 30 minutes until the sauce thickens and darkens. Stir frequently. Barbecue! Bible Sauces Rubs and Marinades by Steven Raichlen pg 134.